Can you believe it’s less than a week until Valentine’s Day? Whoop whoop! My parents always made us kids feel so special on Valentine’s Day, and I love carrying on our family traditions with my own children. Of course, I am Jessica, so all traditions must include thematically appropriate treats (insert monkey covering eyes emoji here.) So, today I’ve rounded up a bunch fo fun and easy Valentine’s Day desserts that will make your loved ones feel so special on V-day this year! I hope you like them. 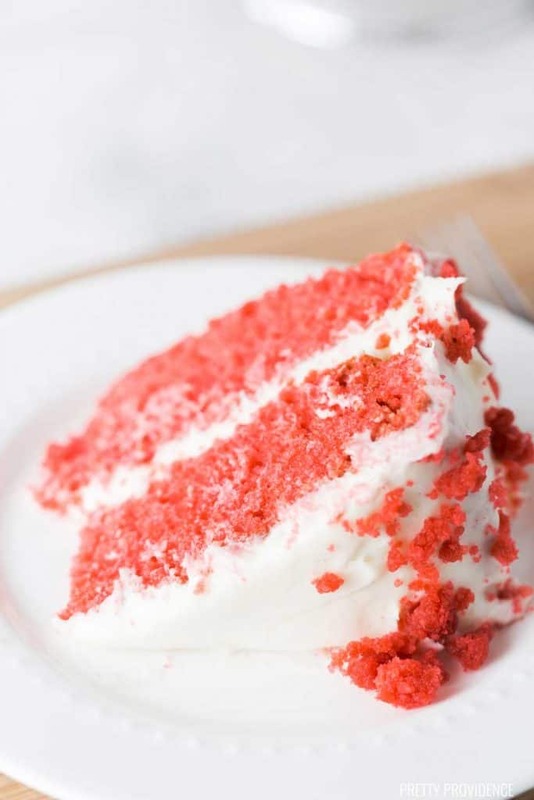 The World’s BEST Red Velvet Cake – This is the cake that my family and I always make for Valentine’s Day dessert! It is TO DIE FOR and it’s really easy, I promise! You have to try it. 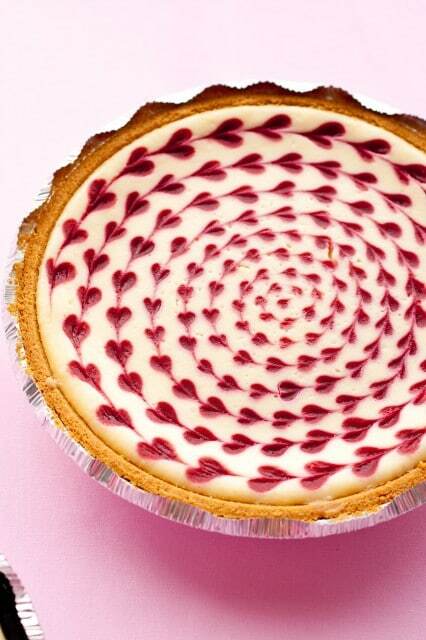 White Chocolate Raspberry Cheesecake – This Valentine’s Day cheesecake from Cooking Classy looks gorgeous and tasty. Sign me up. Cupcakes are always a hit on Valentine’s Day! Involve pink frosting, sprinkles, anything like that and you’ve got yourself a perfect Valentine’s dessert. Pink Velvet Cupcakes -These pink velvet cupcakes look so delicious! 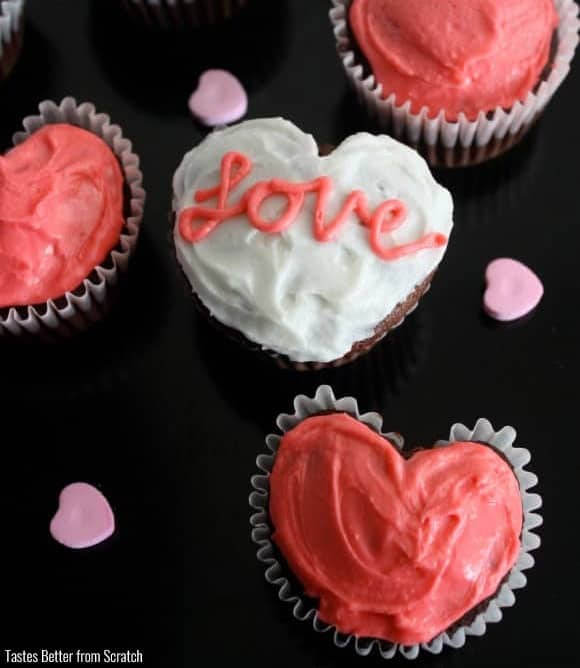 Making heart-shaped Valentine’s Day cupcakes is a breeze – just add marbles to the muffin tin! 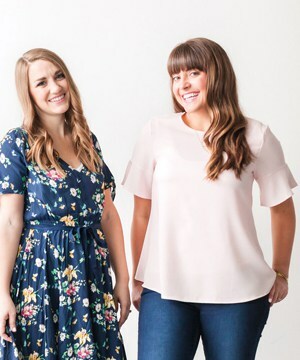 If your love language is food, like me, then maybe making a delicious dessert for two is the perfect way to celebrate Valentine’s Day. I love pulling out all the stops and making treats I wouldn’t normally make for special occasions like this! 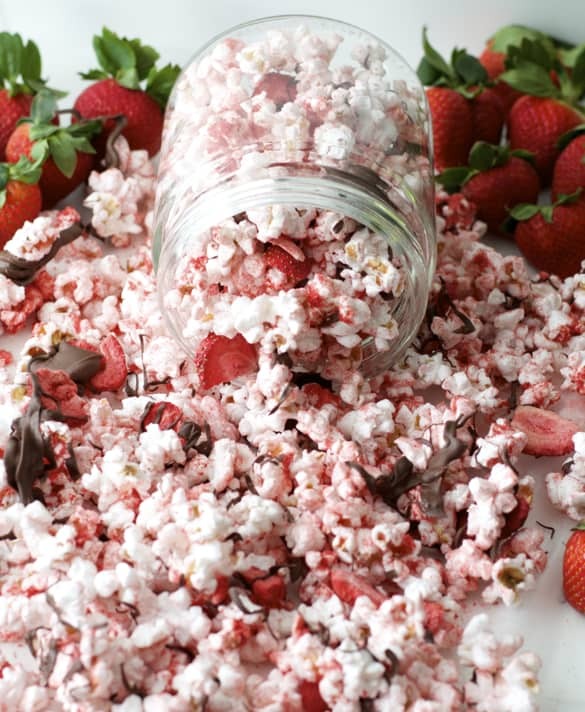 We love this Chocolate Strawberry Popcorn, it’s the perfect thing to accompany a movie for a Valentine’s date at home! 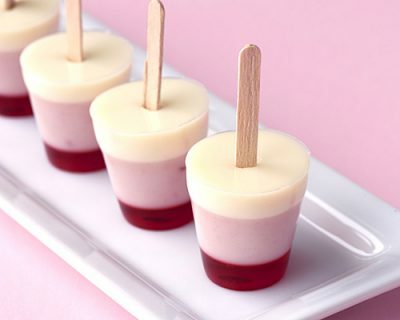 Layered Strawberry Jello Cups – Holy wow. These are gorgeous and honestly, who doesn’t love a good layered Jello? Fancy Dessert Fondue Dippers – Chocolate fondue is one of our FAVES and these easy dippers, including heart-shaped brownie bites cannot be beat! Chocolate Covered Strawberry Hearts – chocolate covered strawberries are obviously a must, and making them at home is actually easy and SO much cheaper. Try these! Hot Chocolate Marshmallow Hearts – These marshmallow hearts are simple but SO fun. Chocolate Covered Raspberries – I had never heard of doing this, but of course now I am dying to try them! Cupids Arrows – Okay these are cute, perfectly Valentine’s Day themed, and easy for kids to make with you! 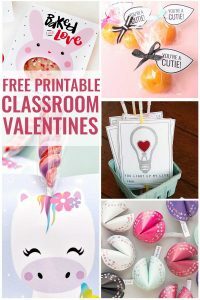 These cutie Valentines make a really good classroom Valentine snack for kids. Plus, they are healthy! Sometimes you don’t want to bake. Especially if you are busy helping with class parties during the day! That’s OKAY. 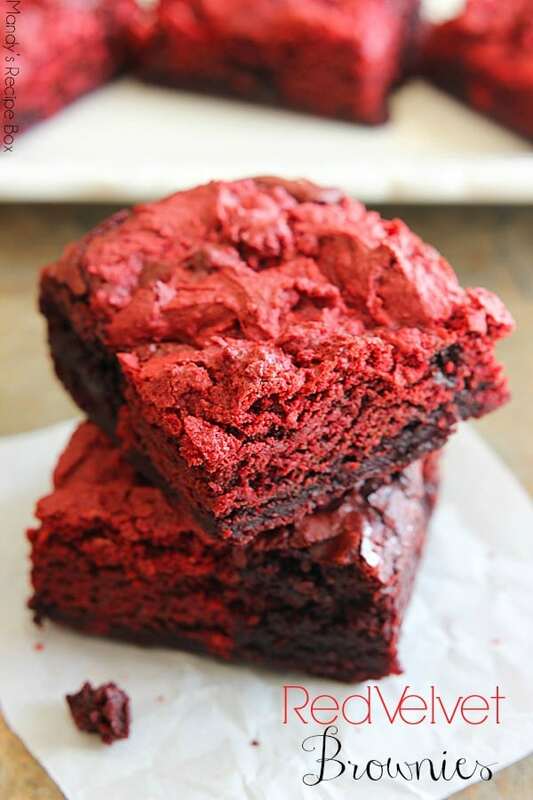 Try some of these sweet and super delicious no-bake Valentine’s Day treats. 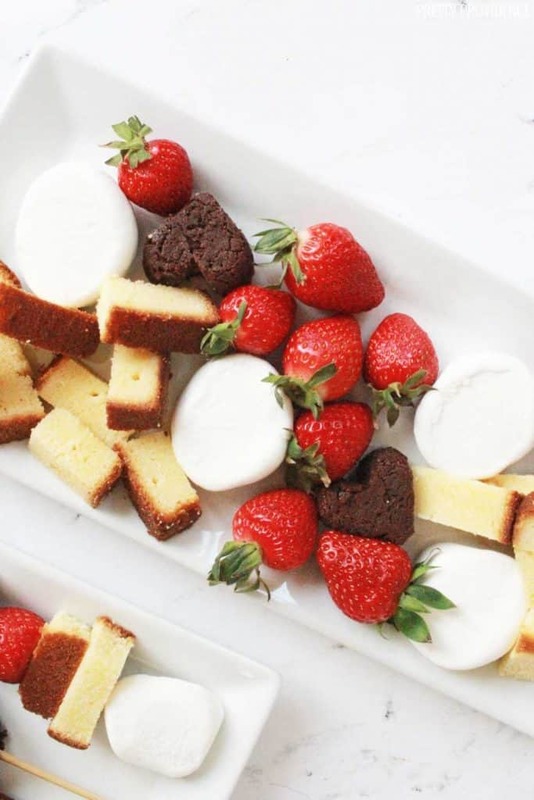 Strawberry Brownie Kabobs – these look divine. I can’t think of a better combo! Heart Milk Cubes – The kids will love these heart milk cubes, and they would go perfect with these rich desserts! Valentine’s Day Pretzel Hugs – I LOVE PRETZELS WITH CHOCOLATE. These pretzel hugs look so delicious! 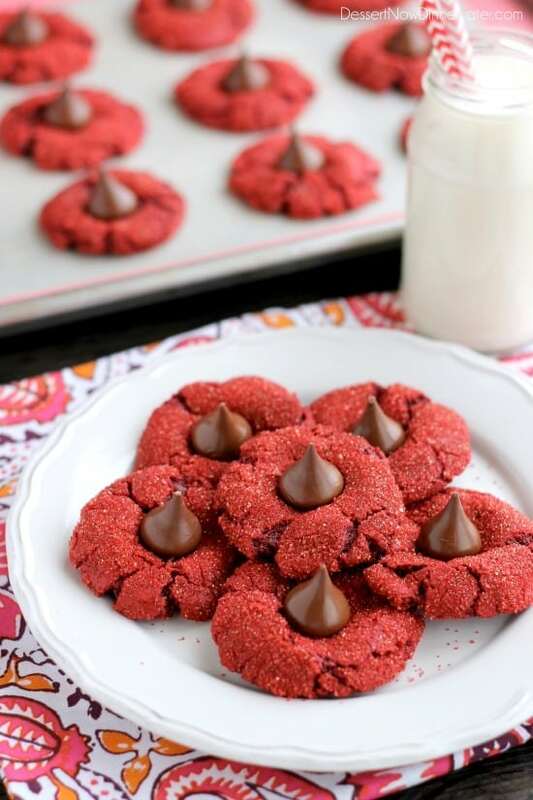 If you’re a cookie lover, try one of these cookie recipes for your Valentine’s Day treat. Red Velvet Cookie Blossoms – Red Velvet is the best idea for Valentine’s Day and I don’t know why I never thought to make them into thumbprints! These are the cutest! Cherry Chocolate Sandwich Cookies – chocolate and cherry is combination that just can’t be beat! Slice and Bake Valentines Heart Cookies – ooh these are so fun, and will totally taste better than the store-bought slice and bakes! 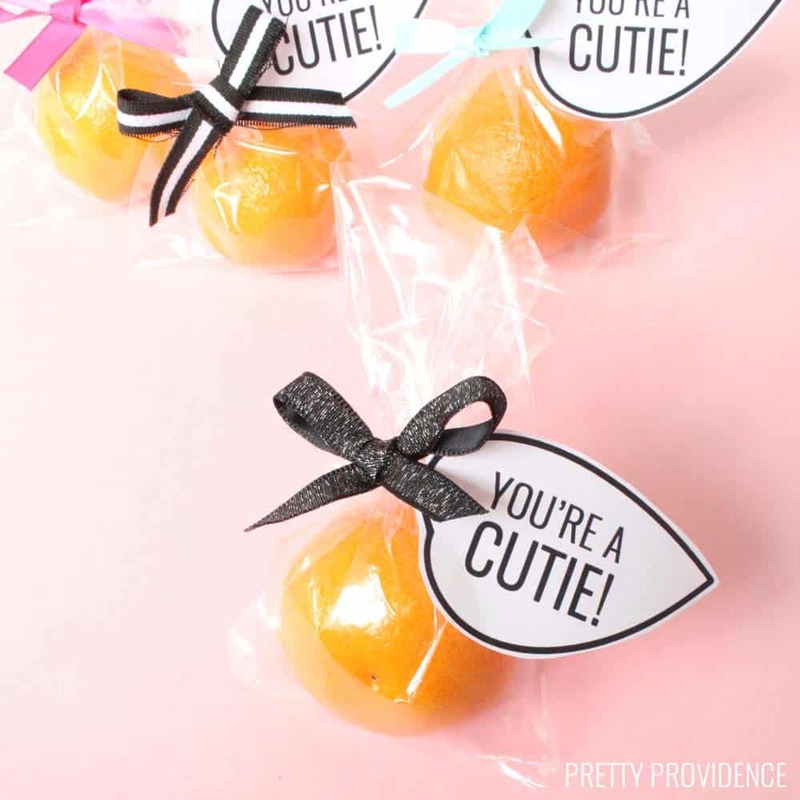 Valentine Hand Pies – OKAY these little pies are the cutest. Aren’t they so fun! I want to make all of them. Good thing it doesn’t have to be Valentine’s Day to make cute heart shaped things. I am a sucker for holiday themed food. 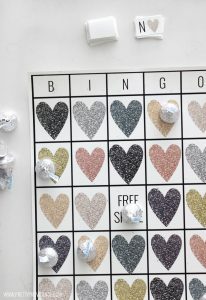 I will definitely be trying some of these!!! I’m glad it’s not just me!! I know right?! I’m right there with you! !